The Wandermere area was one of the hardest hit by the mid-summer storm, which seemed to blast certain areas with the precision of a tornado. As power crews repaired facilities on Sunday, Comcast teams came in to repair storm damage. The Wandermere area was one of the hardest hit by the mid-summer storm, which seemed to blast certain areas like a tornado. As power crews repaired facilities on Sunday, Comcast teams came in to repair storm damage. Most Comcast employees had expected to spend Sunday at the Silverwood resort park for the annual company summer picnic; instead, teams were in the field continuing to repair storm damage. 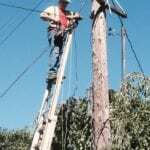 Extra Comcast teams were in the field Sunday as power was restored in several areas. 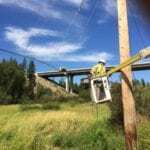 Both electrical crews and Comcast teams were hard at it in Spokane on Sunday, as electricity came back up in all but a couple areas damaged by the freak summer storm. There are more repairs to be made Monday; we estimate the number of homes without service is about 225. Today we’re working at individual homes in several areas as well as badly hit neighborhoods in the Spokane Country Club area and in Pine River Park. 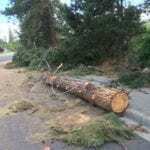 Comcast customers in Spokane who are in storm-damaged areas should please call us to report if their electricity is on, but Xfinity services are off. We’re at the point now where most remaining damage is at individual homes, and we can’t see into every back yard. Your report is an important way for us to know that your home has suffered damage beyond its electrical services. 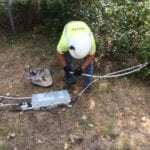 Ninety-nine percent of the time, Xfinity services are restored when power is restored. So if your power is back up, but Xfinity products and services are not, please perform a powercycle of your Internet or video equipment; if that’s not effective, please call 1-800-XFINITY (1-800-934-6489). If you reach a recording saying we know you have an outage, then we know about it, but if not, this is a chance to report the problem. The first teams in after a severe storm are electrical power crews that have to go into these areas first to restore electricity and make the area safe. We can then come in and repair damage to our plant. 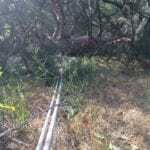 If your power is back on but service is still not working, that could be because of storm damage that you, and therefore we, did not know about until now. And of course that’s very frustrating, because all you the customer knows is that you had to wait just to get power back up. So we very much appreciate you taking the time to call in. For updates and photos, please follow us on Twitter. For updates on electrical repairs from one of the utilities, visit the Twitter account for @AvistaUtilities or https://www.facebook.com/AvistaUtilities Note that Avista is making a similar suggestion in Facebook posts such as this one: If your neighbor’s power has been restored and you still don’t have power, or if our website indicates that you have been restored and that is not the case, we need to hear from you. Please contact Avista at avistautilities.com via the web or your mobile device, or call 1-800-227-9187.